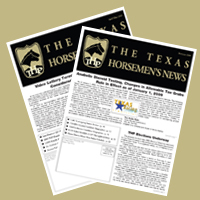 Beginning with its June 2009 issue, the official publication of the Texas Horsemen's Partnership, The Texas Horsemen's News, is moving to an electronic-only format. The change will allow the THP to get important information to members more quickly, effectively, and frequently. It will also help horsemen avoid missed issues due to moving from track to track throughout the year. Be sure to sign up on this site to receive your copy of every issue. The new, electronic version of The Texas Horsemen's News will be distributed via email in PDF format, which can easily be printed if you prefer to read your news in a printed format. If you do not already have a PDF reader, you can download the free Adobe Acrobat reader here. The June 2009 issue is expected to go out during the second week of June, so be sure to sign up before that time. To sign up, either click the link on the homepage of this website or click here.